"To reach the part of the town where Augustine lived in his 'Christian quarter', consisting of his main church with adjacent baptistry, a chapel, the bishop's house, and perhaps a monastery in a building overlooking the bishop's garden, you would have had to leave the main hill, and would have walked a good half mile towards the harbour. . . . Yet, like so many ancient men, Augustine feared the sea. He never dared to sail along the rocky coast to Carthage; he always regarded the seaborne merchant as a speculator, taking the most hair-raising risks." 6. What is the water without substance, save the water of sins without substance? For sins have not substance: they have destitution, not substance; they have want, not substance. In that water without substance, the younger son lost the whole of his substance…Dost thou wish to see how the water is without substance? Take away with thee to the world below what thou hast acquired: what wilt thou do? Thou hast acquired gold: thou hast lost thy faith: after a few days thou leavest this life; thou canst not take away with thee the gold thou hast acquired by the loss of thy good faith; thy heart, destitute of faith, goeth forth into punishment—thy heart, which if full of faith, would go forth unto a crown. Behold, what thou hast done is nothing: and thou hast offended God for nothing. 8. Let them escape the water without substance, and say, “Blessed be the Lord, who hath not given us over for a prey unto their teeth” (ver. 6). For the hunters were following, and had placed a bait in their trap. What bait? The sweetness of this life, so that each man for the sake of the sweetness of this life may thrust his head into iniquity, and be caught in the trap. Not they, in whom the Lord was, they who say, “If the Lord Himself had not been in us;” they have not been taken in the trap. Let the Lord be in thee, and thou wilt not be taken in the trap." "Having finished the prophecy of judgment, so far as the wicked are concerned, it remains that he speak also of the good. Having briefly explained the Lord’s words, “These will go away into everlasting punishment,” it remains that he explain the connected words, “but the righteous into life eternal.” “And I saw,” he says, “a new heaven and a new earth: for the first heaven and the first earth have passed away; and there is no more sea.” This will take place in the order which he has by anticipation declared in the words, “I saw One sitting on the throne, from whose face heaven and earth fled.” For as soon as those who are not written in the book of life have been judged and cast into eternal fire,—the nature of which fire, or its position in the world or universe, I suppose is known to no man, unless perhaps the divine Spirit reveal it to some one,—then shall the figure of this world pass away in a conflagration of universal fire, as once before the world was flooded with a deluge of universal water. And by this universal conflagration the qualities of the corruptible elements which suited our corruptible bodies shall utterly perish, and our substance shall receive such qualities as shall, by a wonderful transmutation, harmonize with our immortal bodies, so that, as the world itself is renewed to some better thing, it is fitly accommodated to men, themselves renewed in their flesh to some better thing. As for the statement, “And there shall be no more sea,” I would not lightly say whether it is dried up with that excessive heat, or is itself also turned into some better thing. For we read that there shall be a new heaven and a new earth, but I do not remember to have anywhere read anything of a new sea, unless what I find in this same book, “As it were a sea of glass like crystal.” But he was not then speaking of this end of the world, neither does he seem to speak of a literal sea, but “as it were a sea.” It is possible that, as prophetic diction delights in mingling figurative and real language, and thus in some sort veiling the sense, so the words “And there is no more sea” may be taken in the same sense as the previous phrase, “And the sea presented the dead which were in it.” For then there shall be no more of this world, no more of the surgings and restlessness of human life, and it is this which is symbolized by the sea." Perhaps such passages in the writings of St. Augustine reflect that ancient fear of the sea that Peter Brown mentioned. He lived near water and used his experience of the sea to explain life, sin, death, salvation and eternity. His references to the sea reflect the perils of fourth century sea travel, as seen in these passages. - Anonymous, hymn, c. 1878, public domain, printed in this month's issue of Magnificat for Prayer for the Evening, Tuesday, April 4. 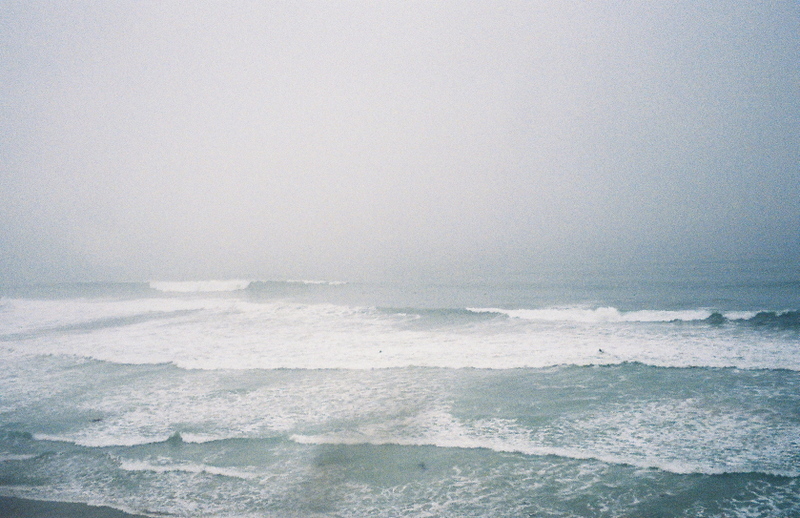 Photo: Swami's Beach, Encinitas, California. Steven Riddle at Flos Carmelli has a post today about Elijah and Mary, speaking of how Carmelite monks and friars have viewed the cloud above the sea as symbolic of Mary, drawn from the story of Elijah in I Kings 18:42-45. One of the meanings assigned to the name Mary in Martianay's edition of St. Jerome's works (S. Hier. opp., t. II, Parisiis, 1699, 2°, cols. 109-170, 181-246, 245-270) is pikra thalassa, bitter sea. Owing to the corrupt condition in which St. Jerome found the "Onomastica" of Philo and of Origen, which he in a way re-edited, it is hard to say whether the interpretation "bitter sea" is really due to either of these two authorities; at any rate, it is based on the assumption that the name miryam is composed of the Hebrew words mar (bitter) and yam (sea). The name "Star of the Sea" for Mary comes from a misunderstanding of St. Jerome's work. Rather than translating the name "Miriam" as "Stella Maris" (Star of the Sea), Jerome actually wrote "Stilla Maris" (drop of the sea). The Catholic Encyclopedia gives the citation to Jerome's translation of the Hebrew at De nomin. hebraic., de Exod., de Matth., P.L., XXIII, col, 789, 842. The symbolism of the sea seems to be deep within human nature, something nearly everyone can immediately comprehend. It appears in varied forms in Christian spirituality, corresponding to the fact that the ocean itself appears to us in varied forms. It can be symbolic of peace and of the Trinity (the "sea pacific" in the Dialogue of St. Catherine of Siena); it can be the unfathomable depths of God's love -- "If the sea were the food of love" -- in the Sayings of St. Catherine of Genoa; it can be the unfathomable complexity of the Trinity in the scallop shell legend of St. Augustine. It can be God in His unfathomable greatness to whom we fly in love, through Christ, as described by St. Paul of the Cross. St. Augustine feared the sea, as was common for ancient men. St. Jerome probably did too. The Psalmist prayed that God would "deliver me from the many waters" (Psalm 143/144:8). In mentioning that Psalm in one of his Wednesday general audience messages on the Psalms, Pope Benedict XVI interpreted the verse about the ocean as symbolizing "the chaos from which the divine hand saves the king." One of the most common images of the sea is a metaphor for the world, in the storms of our lives, the threats to the Church, with the Church or our own souls seen as a ship or a boat on the sea of life in this world. One of many metaphoric uses of the sea in that way appears in another letter of St. Paul of the Cross in which he writes of God as holding in His hands "the tiny ship that is your soul". In a letter of St. Basil the Great, in which he counseled a new bishop to steer his "ship" prudently, and to keep his vessel from sinking in the "bitter waves of perverse doctrine". This, again, reflects the ancient concept of the sea as threatening and as symbolic of the Church's plight in this life, protected by God as we encounter the dangers of a journey in the world. "Mary is the cloud that rises out of the sea. The sea is saltwater, undrinkable, a vast body of water, next to which the kingdom can still thirst and die. The sea is salty, impure, an image of fallen humanity with its admixture of sin. Mary rises out of this sea, pure and perfect, laden with the water of grace that will pour out through her to all humanity--not the source of Grace herself, nevertheless the container into which all is poured until it overflows out to all people, limitless, and life-giving. Not God, but human, Mary rises from the sea, pure and Immaculate in her conception, formed as a vessel of God's grace and a place of refuge for His people." Although the concept of Mary as represented by the cloud above the water would be fairly recent, coming from the Carmelites, it is probably rooted in these more ancient concepts of the sea as symbolic of the world, symbolic of the threats of heresy and destruction that embattle the ship of the Church, and probably also rooted in the earlier understandings of Mary's name as drawn from images of the sea, taken from misreadings from St. Jerome. It is about time that I started adding some structure and interpretation to my little collection of "sea" quotes in my blog's "The Sea" category. I am thankful to Steven for mentioning this Carmelite tradition, which I can add to my collection and use as a starting point for bringing them a little more together. the son of man that thou dost think of him? Bow thy heavens, O LORD, and come down! Touch the mountains that they smoke! send out thy arrows and rout them! “Faced with the all-mighty Lord and notwithstanding his regal dignity the orant feels his weaknesses and fragility. . . . Thus, ‘Why does God concern Himself with such a miserable and fleeting creature?’” asked the Pope. “The answer to this question (cf v. 3) comes when God bursts onto the scene in the so-called Theophany and its a procession of cosmic elements and historical events that celebrate the transcendence of the supreme King of being, the universe and history. Hence the mountains erupting (cf v. 5), striking thunderbolts that scatter the wicked (cf v. 6), the ocean “waters” symbolising the chaos from which the divine hand saves the king (cf v. 7)." "After this Jesus revealed himself again to the disciples by the Sea of Tiberias; Simon Peter, Thomas called the Twin, Nathanael of Cana in Galilee, the sons of Zebedee, and two others of his disciples were together. Simon Peter said to them, "I am going fishing." They said to him, "We will go with you." They went out and got into the boat; but that night they caught nothing. Just as day was breaking, Jesus stood on the beach; yet the disciples did not know that it was Jesus. Jesus said to them, "Children, have you any fish?" They answered him, "No." He said to them, "Cast the net off of the right side of the boat, and you will find some." So they cast it, and now they were not able to haul it in, for the quantity of fish. That disciple whom Jesus loved said to Peter, "It is the Lord!" When Simon Peter heard that it was the Lord, he put on his clothes, for he was stripped for work, and sprang into the sea. But the other disciples came in the boat, dragging the net full of fish, for they were not far from the land, but about a hundred yards off. When they got out on land, they saw a charcoal fire there, with fish lying on it, and bread. Jesus said to them, "Bring some of the fish that you have just caught." So Simon Peter went aboard and hauled the net ashore, full of large fish, a hundred and fifty-three of them; and although there were so many, the net was not torn. Jesus said to them, "Come and have breakfast." Now none of the disciples dared ask him, "Who are you?" They knew it was the Lord. Jesus came and took the bread and gave it to them, and so with the fish. This was now the third time that Jesus was revealed to the disciples after he was raised from the dead." "Thou, oh eternal Trinity, art a deep Sea, into which the deeper I enter the more I find, and the more I find the more I seek; the soul cannot be satiated in Thy abyss, for she continually hungers after Thee, the eternal Trinity, desiring to see Thee with light in Thy light. As the hart desires the spring of living water, so my soul desires to leave the prison of this dark body and see Thee in truth. How long, oh! Eternal Trinity, fire and abyss of love, will Thy face be hidden from my eyes?" The Dialogue of St. Catherine of Siena: 1347-1380, translated by Algar Thorold, Tan Books and Publishers, Inc. 1974. The Trinity: "The Sea Pacific"
"Oh! Eternal Father, that You have illuminated me with the light of holy faith. Of a truth this light is a sea, for the soul revels in You, Eternal Trinity, the Sea Pacific. The water of the sea is not turbid, and causes no fear to the soul, for she knows the truth; it is a deep which manifests sweet secrets, so that where the light of Your faith abounds, the soul is certain of what she believes. This water is a magic mirror into which You, the Eternal Trinity, bid me gaze, holding it with the hand of love, that I may see myself, who am Your creature, there represented in You, and Yourself in me through the union which You made of Your godhead with our humanity."